Brand new IDE to SATA or SATA to IDE Adapter with high quality! Converts Serial ATA to Paraller ATA. Converts Paraller ATA to Serial ATA. Compatible with Serial ATA specification. An IDE to SATA or SATA to IDE Bridge adapter converter. The IDE to SATA Adapter kit allows you to convert SATA to IDE or IDE to SATA (NOT SIMULTANEOUSLY). 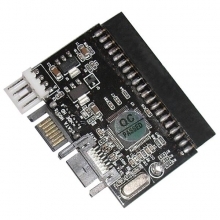 IDE to SATA Converter allows a fast data transfer rate of up to 150 MBytes/sec. Supports plug and play installation. Upgrade to SATA (Serial ATA) speed and performance without overhauling your entire system with this IDE to SATA hard drive upgrade kit. With up to 150 MBytes/sec fast data transfer, improved airflow inside your case, and enhanced data integrity and security, you get all the benefits of a SATA system at a fraction of the cost. Includes a power connector and a SATA data transfer cable to make your upgrade to SATA even easier.